What Are the Best Guard Dogs? “The dog is man’s best friend” may sound like a trite axiom but it remains true ever since the first canid was tamed. This versatile companion is part friend, part sentry, part colleague. He gives love and affection but the next moment will literally lay down his life for his two-legged companion. With his capable hearing and smelling, he is part hunter and tracker. Thankfully, dogs come in all sizes but still have the same instincts to love and protect their humans. Whether you want a small fluffball or a large beefcake, you can find a guardian angel in the soul of every dog. Rat terriers are some of the best guard dogs. While they probably won’t be able to single handedly take down an assailant, they are one of the most alert dogs, bred to detect the tiniest sound. They have a bad reputation for barking every time the doorbell rings but rat terriers are highly trainable. Their focus is amazing – they can hone in on their prey for hours on end, patiently waiting for the moment to pounce. Amazingly, rat terriers will be able to distinguish abnormal sounds from everyday sounds. They can even detect a friend knocking on the door as opposed to a stranger. They are a little too smart for their own good, finding many ways to play pranks on their humans. As puppies, they are hyperactive but will calm down with a few years under their belt. A small dog with a deeper bark, the Dachshund is short but fearless. Doxies, like terriers, are very alert and can also identify strange people and sounds. They are not as hyperactive as rat terriers but they are fun-loving. They can also be a couch potato on those days you don’t feel like getting out of your pajamas. Unlike their rat terrier cousin, they won’t chase every squirrel they see, leading you on a frenzied chase with every walk! 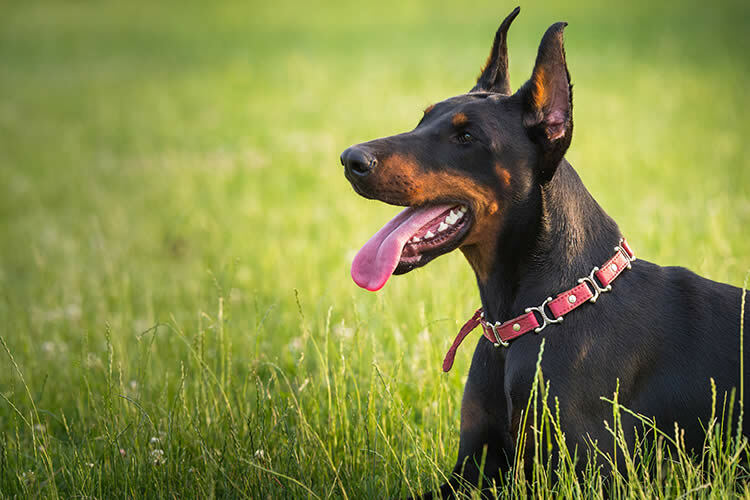 Majestic and fearless, the large Dobie is a handsome dog who quietly watches over her territory. Being agile, lithe, and long-legged, Dobies can easily prowl around large areas of land and run swiftly to their destination. They are extremely loyal but also quite obedient. Being incredibly intelligent, they are highly trainable and respond well to commands. As a very athletic breed, Dobies can protect their humans from violent intruders if necessary. Pulis are known for their watchfulness and have the reputation for being circumspect around strangers. They only love their family, so everyone else will have to earn the Puli’s trust. Yet, Pulis have a playful side too. They love outdoor activities such as hiking and going to the beach. They are great for families as they are gentle and protective of their charges. Pulis score high on the doggy IQ scale, meaning they can be trained for a variety of tasks. They do not like to be alone, so don’t adopt one if you will be away from the house for long periods of time. As with all dogs (and humans), guard dogs must be properly trained and socialized to function as healthy, happy family dogs. Training a dog to solely exist as an attack dog is not acceptable in civilized society. Guard dogs, like any dog, are mainly companions who also have an extraordinary ability to ferret out dangerous situations. Guard dogs are not meant to attack first – small and medium sized dogs will not have the strength to overpower human assailants. Guard dogs are meant to alert their family that danger is present – it is up to you to act on that information and protect your household as is allowed by law. Forcing your dog to act as your defender will not only put his life at risk, but your own as well. Let your guard dog do what he does best – detect strange smells and sounds and to alert the family members that all is not well on the homefront. At What Age Is a Puppy Full Grown? Can Animals Sense the Supernatural?